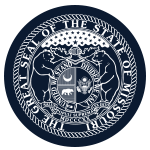 Mission: To achieve maximum investment return while minimizing risk to the funds of the County Employees' Retirement Fund in order to provide and enhance benefits to the county employees of Missouri. Function: To manage the operations and investments of the County Employees' Retirement Fund. Number of meetings: Approximately 6 board meetings and 8 committee meetings per year. Preparation time for meetings: Approximately 6 hours for board meeting. Approximately 2 hours for committee meetings.